BALLSTON SPA – Nancy Scott Coryea, 85, died Tuesday, Dec. 17, 2013, at Maplewood Manor Nursing Home in Ballston Spa. 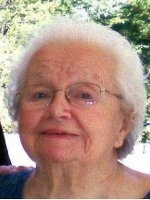 She was born on Dec. 26, 1927 in Ellenburg Depot, to Lois Chilton Scott and William F. Scott, Sr. A memorial mass is scheduled for Friday, January 3, 2014, 11 a.m., at St. Mary’s Catholic Church in Ballston Spa. Nancy was my mother’s best friend for years. I will never forget the trip we took to visit Grandma Lois in Mom’s red truck and plenty of fog. It is like another part of my youth has been severed. I loved her dearly. My condolences are sent to the four boys. I only knew Nancy at Maplewood. She always seemed to take life in stride. She had a twinkle in her eye that made you expect to hear her say something to make you smile….or think again! God be with her.